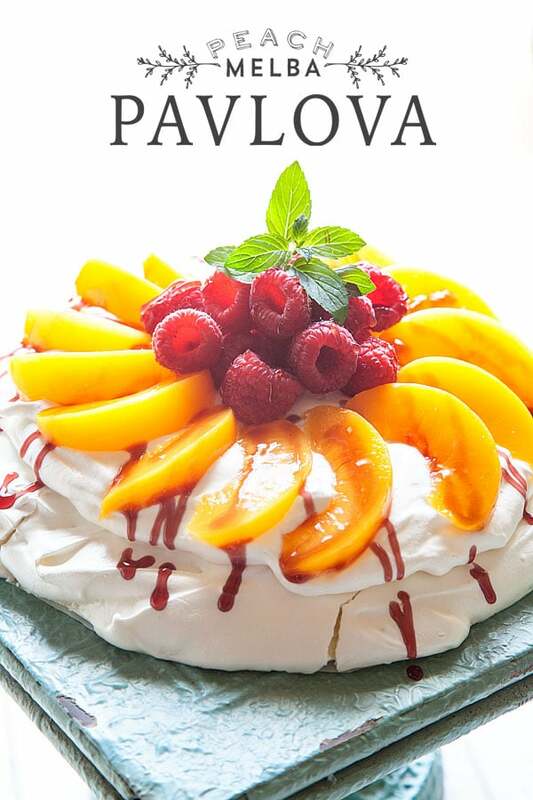 The Aussie’s may have a fun classic twist on summer dessert… PAVLOVA! It’s a light, airy dessert that can be topped with all kinds of summer fruit. I have been a long time fan of Cheryl’s and I just adore her and all of her work. So, back to the pavlova. My Mom lived in Australia for a few years back in the day. She introduced this dessert to me when I was a teen and the flavor combination has been one of my favorites ever since. This is a combination of two desserts really, peach melba which is peaches with raspberry sauce on ice cream and pavlova, a meringue style dessert. They are both iconically Australian so I thought to combine them both would be perfect. You will then pour it out onto a parchment-lined baking sheet. 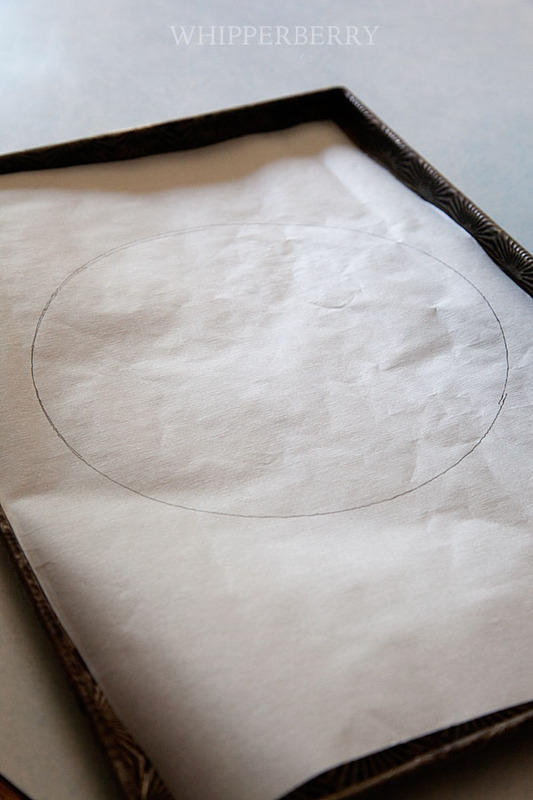 If you would like to have a specific sized circle, you can use a plate to draw a circle onto your parchment paper with pencil and then just flip the parchment over, using the circle as your guide. 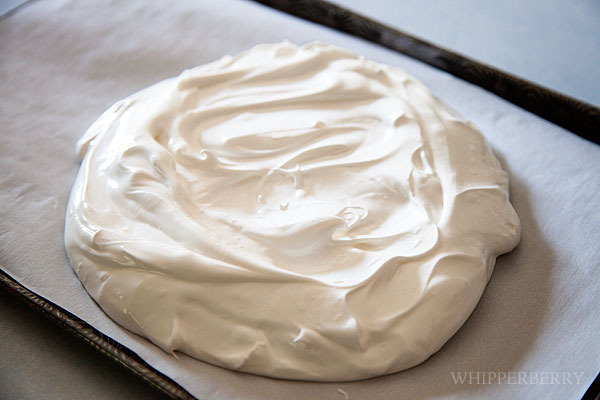 Spread out your pavlova onto the baking sheet. And place in a 180˚ oven for 2 hours. You are essentially drying out the egg whites, not really baking them. Once the baking time is up. Just open the oven and let the pavlova sit in the oven for a few more hours to continue to dry out. At this point, you can store your pavlova in an airtight container for a few days if you aren’t quite ready to serve it. This makes it perfect to serve at a party. Any time you can prep days before the party you are set! Then all you have to do the day of the event is make up some Chantilly cream, which is just a fancy way of saying sweetened whipped cream and then top with peaches and raspberries. Place a thick layer of whipped cream onto the pavlova and then top with your peaches. You can use fresh if you have some or canned peaches will work just fine as well. This sweet and light dessert is perfect for those warm summer nights! Prepare your pan by drawing a circle on a piece of parchment and then flipping it over so you don’t get pencil on the pavlova. 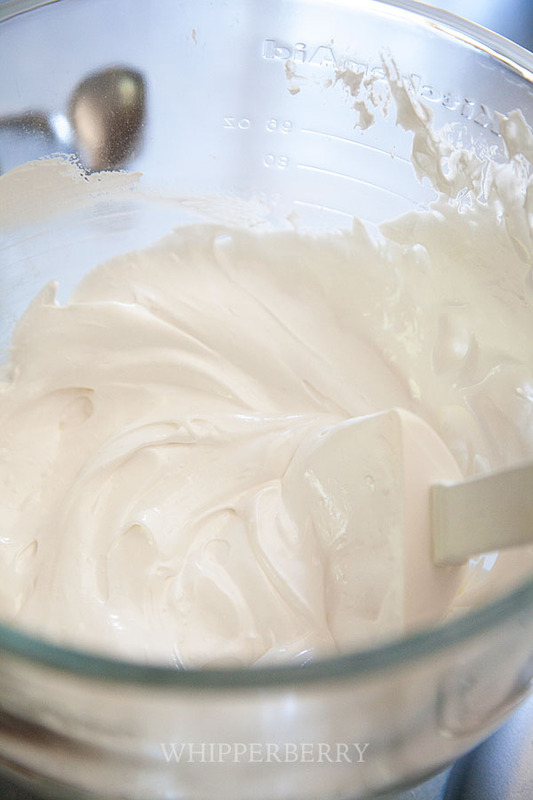 Place your room temperature egg whites into your mixing bowl and whip on high until you have soft peaks. Add your vanilla, salt cornstarch and vinegar and whip on high again, slowly adding your sugar. Once the sugar has been fully incorporated, pinch a little bit of the egg whites in-between your fingers and make sure it doesn’t feel gritty and the sugar has been dissolved. Place the mixture on your baking sheet and spread into your circle. Place into the preheated oven for 2 hours. 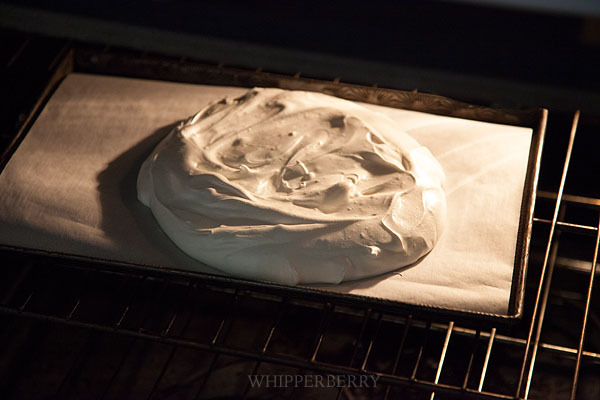 After 2 hours, turn off the heat, open the oven door and let the pavlova sit for another hour or two. When ready to serve, make up your whipped cream. In a chilled mixing bowl, add your whipping cream. Whip on high for 1 minute. After 1 minute slowly whip in the sugar and vanilla. Whip on high until you achieve your desired consistency. Don’t whip too long or it will turn into butter. 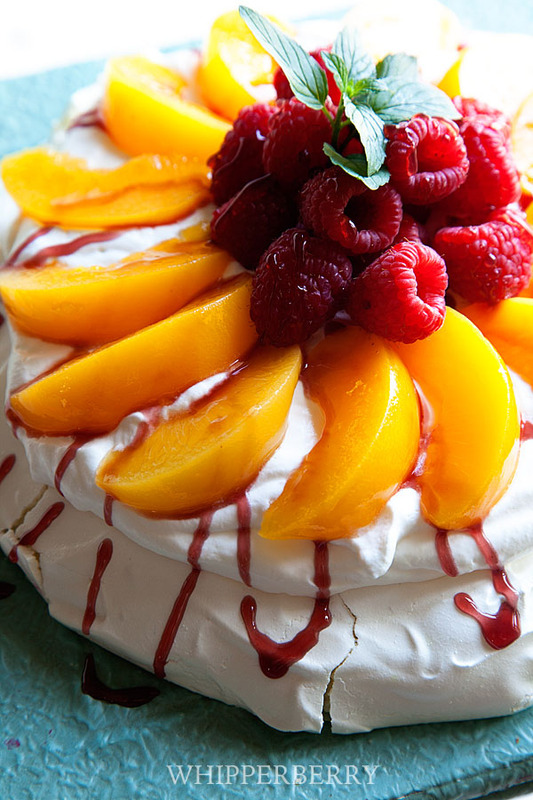 Top your cooled pavlova with a thick layer of whipped cream and top with peaches and raspberries. Drizzle with a raspberry sauce. Beautiful, stunning work as always from Heather! 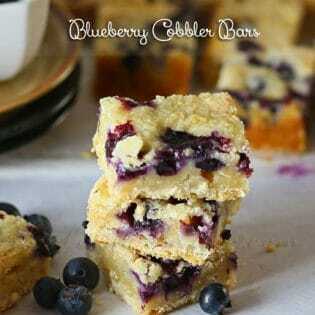 Can’t wait to try this dessert idea! Do we add it after or bfore sugar? the cornstarch is added in step 4. Enjoy!! Beautiful dessert. 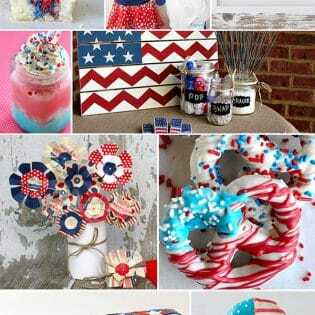 I have to make this and hope it turns out as pretty as yours. Thanks for sharing. My husband’s great aunt makes this but it is a German recipe called Schaumtorte. We only eat it in winter after making eggnog from the yolks. 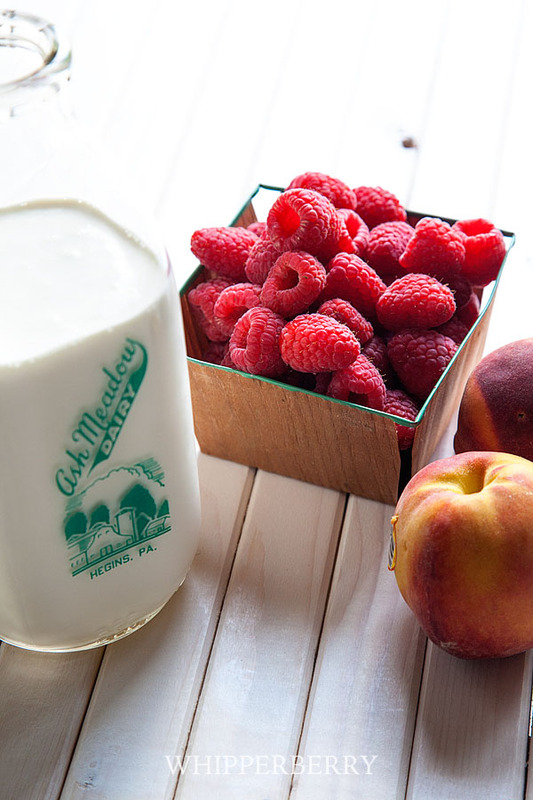 We top ours with berries rather than peaches. Hi Heather! It’s nice to meet you virtually through this guest post. Your photography is beautiful and the recipe looks stunning! Wow – its so pretty! And it looks delicious! Oh Heather!!! It’s just beautiful! This is gorgeous! my parents have a peach tree in their yard so I will definitely be trying this out! I’m a sucker for meringue. Yum! So pretty – this would great for summer entertaining – it looks so impressive and I love the fresh summer fruits on top! 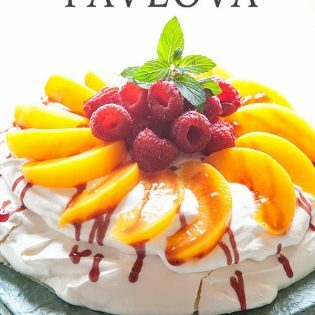 I’ve had pavlovas as a must-make recipe for a long long time. Don’t know what I’ve been waiting for. It looks so lovely and a great way to showcase seasonal fruit. Mine looks burned after 20 min at 350F. Is the 180 at Fahrenheit?.